After much contemplation, this is the result of combining different methods of adding beads to a "FLARE" leather braid (FL-at + squ-ARE techniques together in each row). The multi-coloured glass beads were purchased from Paul (www.nharo.com) at a recent GRBS meeting. Originally from Ghana, they are made from powdered glass that is melted, mixed with a ceramic pigment, painted, then re-fired. 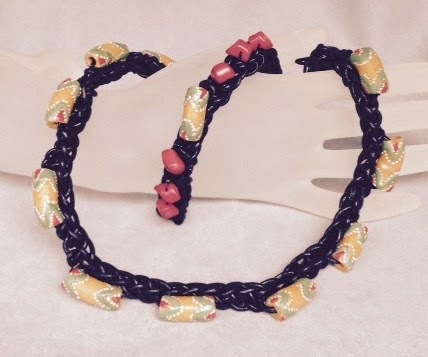 The unique curved shape to these beads is perfect for this necklace and bracelet application. The bracelet has an added feature of dyed coral chips which were strung on nylon instead of the leather. I will bring this set to the Toronto Bead Society show coming up Nov. 8 & 9 (see www.torontobeadsociety.org for details). Come by my table and say HI if you are there!